Sweetie is not always ready for a nap, even when her eyes are closing and all systems are going in to “sleep” mode. Watching her fight can sometimes be tough. Other times it’s all I can do to not laugh out loud. I tell her it’s no use – when it’s time to sleep, the Sandman always wins. We have a good nap schedule and Sweetie follows it well. There are the occasional times, though, when she starts nodding off during meals or while playing. This is usually after a nice busy afternoon or some other special circumstances. Much like her snoring, I am the source of this quirk as well. Sleep stories from my childhood include crashing out behind the Christmas tree, nodding off while sitting on the stairs and napping on a power boat ride. I know this is not true narcolepsy, but is this tendency genetic? 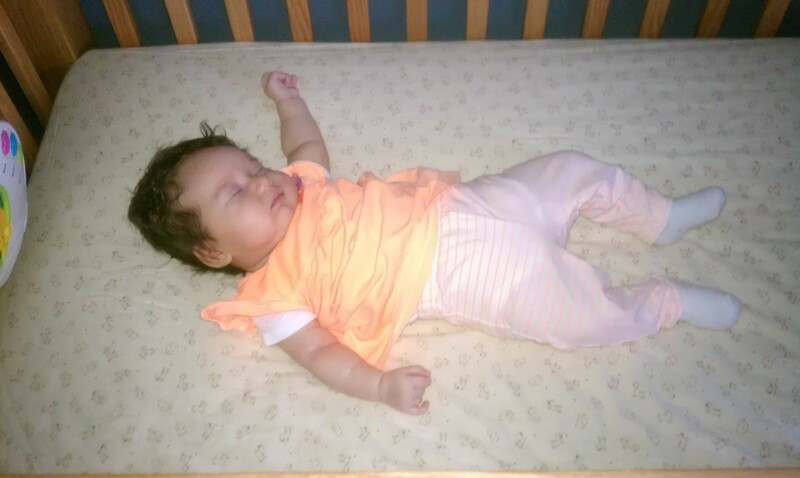 Sweetie usually naps in her crib. And we are working hard to put her down before she is asleep to help her develop the ability to put herself to sleep. Overall it is working well. The times that she falls asleep in your arms or on the circus mat are priceless. And I think laughing at those times is harmless, more as enjoying the moment than mocking the child. In fact, I believe the Sandman gives a little chuckle whenever we finally give in and nod off.